This mod provides permissions control and user management through the use of user groups. With this mod, admins are able to create groups for users and assign group permissions. Group permissions allows admins to limit access to commands to certain groups. Groups can also inherit from another group. This allows a group to have all of the permissions that another group has without needing to reassign all of the permissions. This mod works for commands added by other mods, unless there is a conflict between the names of commands. GroupManager creates a config file in the Configs folder for the server. The config is located in a new "GroupManager" folder, and the file is called "Permissions.eco". It also adds a tab to the server UI with information about the current groups on the server and which users are assigned to which groups. 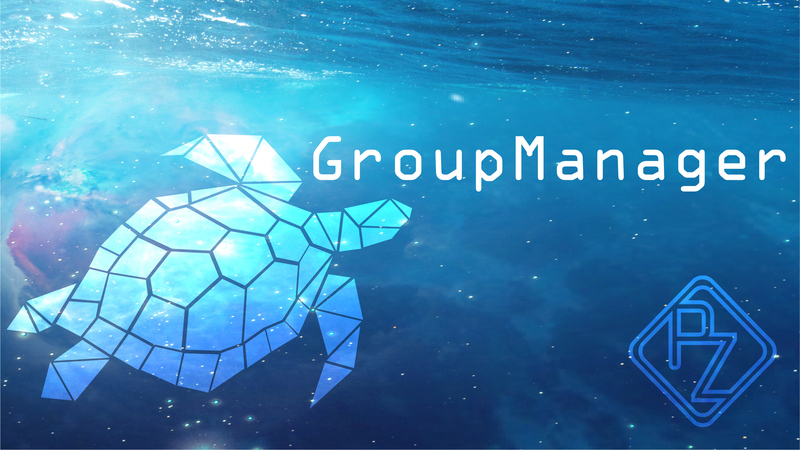 GroupManager can also be found and downloaded on my website here. The mod creates a sample config file the first time it is loaded, or if it can't find an existing config file. For a detailed explanation on how to use the config file, go here. /gm-help [command] Lists the commands that the user is allowed to use. Specifying a command gives a description of the command and shows how to use it. /gm-save Saves the permissions system to the config file. /gm-reload Reloads the permissions system from file. This allows for the system to update from manual changes to the config file without needing to restart the server. /user (target user),[option,[param]] Allows for control of users and the group they belong to. /user (target user) Displays the target user's group. /user (target user),assign,(group name) Assigns the target user to the given group. Informs the player if the command fails and why. Informs both the player and the target user if the command succeeds. user (target user),remove Removes a user from their group. Informs the player if this succeeds or fails. /group (group),[option,[param]] Allows for control over groups and their permissions. /group (group) Displays all of the commands that the given group has access to. This includes commands available through inheritance. /group (group),create Creates a new group. Indicates if the group already exists. Sets the new group to inherit from the default group if one exists. /group (group),delete Deletes the given group if it is not the default group. Users from a deleted group are moved to the default group if one exists. /group (group),users Lists all of the users that belong to the group. /group (group),inherits Displays the given group's parents (inherited groups) if it has any. /group (group),inherits,(other group) Toggles whether or not the group inherits from the 'other group'. Indicates whether the group now inherits or does not inherit. /group (group),addcmd,(command) Adds the given command to the list of commands available to the given group. Register a command by its name, e.g. "ban" for "/ban". /group (group),delcmd,(command) Removes the given command from the list of the given group's commands. "command" must be the command's name, e.g "ban" for "/ban". As with all of my other mods, you are agreeing to abide by my license by downloading, installing, and using GroupManager. Fixed a bug that prevented players from recieveing a message when an admin command was used on the server if the server had DisplayAdminCommands set to true in Users.eco. Changed the name of the commands "/perm-save" to "/gm-save" and "/perm-reload" to "/gm-reload". Users need to use "/gm-help command" to get help for a specific command. The command "/group" has a new option: "users", this lists all users in the specified group. The command "/group" has a new option: "delete", this deletes the group if it is not the default group. Users from the deleted group are moved to the default group if one exists. The command "/group groupName,inherits,otherGroup" now toggles whether the group inherits from the other group. The command "/group groupName,create" now makes the new group inherit from the default user group if one exists. In the Plugins tab in the server UI, the mod name has changed from "Permissions" to "GroupManager". The mod's tab in the server UI has also been changed from "Permissions" to "GroupManager". Added a boolean property to each group called "defaultGroup", only 1 group can have this set to true. Entries in the Users property now use a KeyValuePair instead of a string. The "Key" is the user's SteamID, and "Value" is the user's SlgID. To use just one of the IDs, leave the other set to null. Removed the "Children" field, and renamed the "Parent" field to "Children". Made the mod thread safe. Rewrote the internals of mod, including how the mod stores and handles data. Pulled from AdminUtils and made in to its own mod.